Just recently as 150 years ago, a trip to the dentist would often end with the patient leaving with fewer teeth than he or she had before sitting down. In the days of Doc Holliday, dentists focused more on alleviating pain and discomfort than preaching about the best ways to prevent tooth decay and gum disease. That would often mean removing problematic teeth from the mouths of patients that had become too rotted or diseased to remain. Fortunately, the 20th century saw unprecedented advances made in the dental arts. Health experts like family dentist in Beaverton, OR Dr. Richard Barrett became more focused on preventative dentistry, which told patients how they could avoid oral health problems by brushing and flossing more frequently. Technological advances were made that allowed dentists to x-ray teeth to look for potential cavities, and fluoride became more commonly used to help build enamel strength. Despite all of the advances already made, the future promises to hold even more surprises that seem the stuff of science fiction rather than reality. Currently, researchers in labs across the world are experimenting with techniques that would allow humans to continue regrowing teeth throughout their lifetime, instead of being limited to only two sets. Until that day arrives, however, a breakthrough made less than 40 years ago has allowed dentists to come closest to replacing a patient’s missing tooth – dental implants. The technology for implants was first developed in Sweden during the 1960s as part of a failed experiment designed to create synthetic feet for amputees. But the first dental implants were not performed in the U.S. until the early 80s. Early implant procedures were conducted in operating rooms and involved safety protocols very similar to what you’d expect for major surgeries today. Patients and doctors were both scrubbed down, and sterile drapes were place over the patient’s head and body. Today implants procedures are routinely done in the dentist’s office, and only require basic precautions. Healing times for dental implants have also greatly improved, as early procedures would often require six months to fully heal when performed on the upper jaw and three months on the lower jaw. Now recovery time has been reduced to as little as six to eight weeks for both upper and lower jaws, and procedures are successful 98 percent of the time. In 2011 alone, dentists across the U.S. placed over five million implants, according to the American Dental Association. When are Implants the Right Decision? 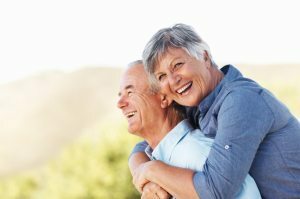 Whether to replace missing teeth with a bridge, dentures or an implant really depends on a number of factors, including a dentist’s recommendation, patient preference and what promises to be most comfortable and durable. Many patients might find wearing dentures a simple and convenient solution, and don’t mind needing to remove and clean them nightly. Others might feel uncomfortable about wearing dentures, or have problems with them moving around or falling out. Bridges offer the most realistic look and feel compared to natural teeth, but require drilling away and covering healthy teeth, which many patients feel negatively towards. The choice of which procedure to go with certainly isn’t an easy one, and patients should never feel rushed or hurried to make their decision. In the end, patients need to feel confident and healthy about whatever decision they make, as choosing incorrectly could cause further problems down the line. Come in and see if dental implants are an option for you! Call 503-690-9667 for your personal appointment at Barrett Family Dental. When it comes to teeth whitening in Beaverton, our staff at Barrett Family Dental understands that most people desire a bright smile. It’s not surprising then that teeth whitening has become the most popular cosmetic dental treatment performed in the U.S. While teeth whitening in Beaverton may seem like a way to improve the health of your smile, you shouldn’t ignore what problems may be the causing the color of your smile to dim. When it comes to teeth whitening in Beaverton, our staff at Barrett Family Dental understands that most people desire a bright smile. Schedule Your 2018 Dental Visits! Looking for a Beaverton dentist? 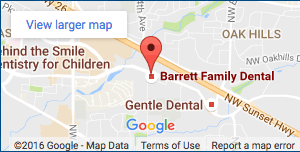 At Barrett Family Dental, we are conveniently located within 2 miles of both Intel and Nike campuses. We work with ODS and Delta Dental so you won’t have to hassle with insurance claims. We even offer extended hours visits by appointment for your convenience. We know you’re busy so we’ll get you in on short notice, pamper you and get you back to the office in no time! Need a Beaverton dental appointment? Barrett Family Dental is accepting new patients. Schedule your dental appointment online! When it comes to providing family dental care in Beaverton, our team at Barrett Family Dental strive to protect the oral health of patients both young and mature. Unfortunately, many seniors fail to provide their oral health with the same kind of attention as they do when even just a few years younger. For many seniors who struggle with poor oral health, tooth loss, dentures, and problems eating are just a natural part of growing older. In our family dental care in Beaverton blog, we highlight a new study that suggests many prescription medications cause dry mouth, a serious health problem. Free Dental Exam and X-Rays! Regularly valued at $200, we’ll give you a free comprehensive dental exam and x-rays with a paid teeth cleaning. We want you to have an opportunity to visit our dentist office, get to know our dentists and team and see for yourself why so many satisfied patients keep coming back! At Barrett Family Dental we place the health and comfort of patients as our number one priority. We strive to be the number one dental office serving Beaverton, OR, providing complete dental care for the whole family in a comfortable, friendly and caring environment.